Most Avid editors know that the system offers two ways to create titles: the venerable Title Tool and Marquee. But there’s also a third way. It’s one of Avid’s best kept secrets, but also maddening because of some key omissions. It’s called the SubCap effect. 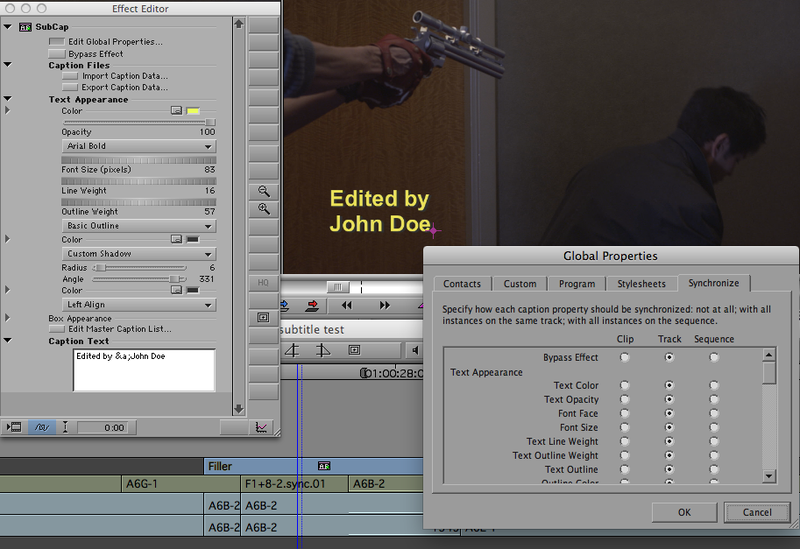 Designed for subtitling, you apply the effect to a clip of filler, open the Effect Editor and simply type in your text. Changes happen in real time — no rendering is needed. You can also create a series of titles all at once by importing a file containing text and timecode values. Best of all, you can change the characteristics of all the titles in a track or sequence simultaneously. My initial thought was, “this would be great for a main title!” But the subcap is crippled in several ways. First, you can’t add a carriage return to text by hitting return. You have to enter an obscure escape sequence (&a;). Second, and much more damning, you can’t have different fonts or sizes within a title. You can’t make “Directed by” smaller than “John Doe,” for example. And finally, you can’t create a soft drop shadow. Those limitations have prevented me from using this powerful tool for any real-world main title. But it’s still found a home in my cutting room. I recently used it to make a series of titles describing missing shots. As the scene changed, I quickly changed the text, without re-rendering. Drag the effect to a segment long enough to handle the titles in your file. (Make sure it covers the master timecode values in the file.) Then click Import Caption Data and navigate to your file. The subcap effect will break the filler into title cards according to your list. To synchronize your titles, first format one title the way you want it. 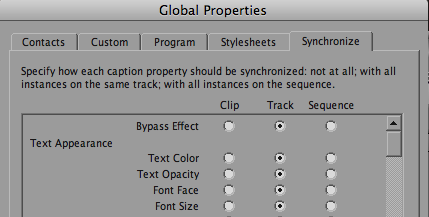 Then click Edit Global Properties and synchronize all titles to match the one you formatted. You can also create stylesheets and use them to create different looks. This entry was posted on June 20, 2011 at 6:36 am and is filed under Avid, Avid Technical Tips. You can subscribe via RSS 2.0 feed to this post's comments. You can comment below, or link to this permanent URL from your own site. I’ve never thought of using it for titling. I have used, very effectively, for subtitles for a doc that I got with multiple languages. I found it very flexible, very responsive and very easy to use (once I figured out how to put it in multiple locations).